CAN in Automation (CiA) is proud to offer the service of CANopen interoperability testing in CAN in Automation`s testing laboratory. 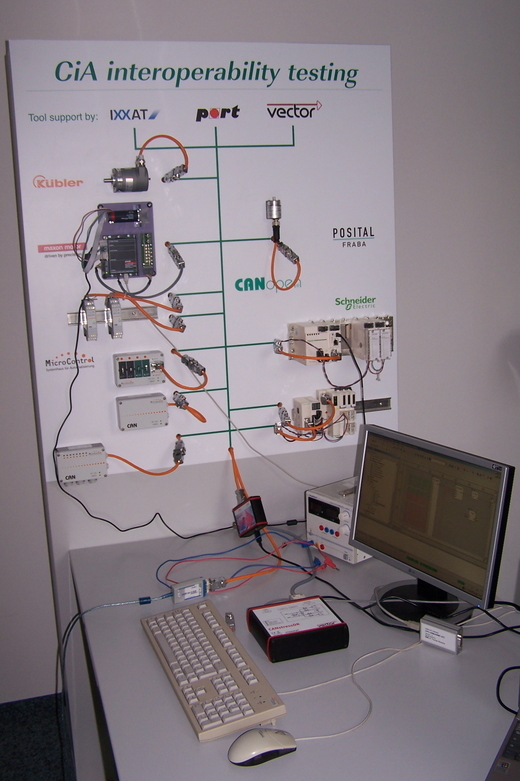 Supported by CiA member companies such as Fritz Kübler, Ixxat Automation, Maxon Precision Motors, Micro Control, Port as well as Posital, Schneider Electric Automation and Vector Informatik a special test stand was built up for this purpose. CANopen interoperability testing is a service for CiA member companies only. The aim of the interoperability test is to assure that CANopen devices are capable of interacting with a variety of other CANopen devices from multiple vendors, all integrated in the test stand. The heart of the test stand is the mid range PLC for industrial process and infrastructure – Modicon M340 from Schneider Electric used for the configuration of the devices. Further the test stand is equipped with a variety of other CANopen devices, such as I/O modules, encoders, drives and so on. CANopen interoperability testing offered by CAN in Automation is a service that verifies that the device under test (DUT) is able to interact in a CANopen multi-vendor system. • Test whether DUT can be integrated by means of Schneider Electric’s Modicon M340. Detailed information on CANopen interoperability testing is available at CiA office.